Apologies for flooding your hard drives yet again, but I’ve been meaning to post this tape for months now, and it’s due time for it to be heard. 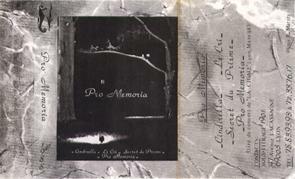 Here we have the debut demo cassette from Pro Memoria, a haunting and gloomy French Coldwave band from Lyon, one of the country’s hotspots for this sound. The cassette was self-released in 1988, and features three incredible studio tracks and one live number to top it off. Fans of Cocteau Twins, Lost Desert, Rosa Luxemburg, Baroque Bordello, Collection D’Arnell-Andrea, etc. will love this one. There are a handful of scattered compilation appearances around the same era as this release, including two tracks on the often mentioned Nos Années Folles compilation (Lost Desert, Spleen Ideal, etc.) The band changed their sound a bit to incorporate some jazz influences, releasing Elegia in 1991. You can grab that one from 7” From the Underground. “Cinderella” from this cassette has been cleaned up and reissued on the excellent Transmissions Continued compilation on Infrastition. This entry was posted on March 29, 2013 at 3:48 am and is filed under 1980s, 1988, coldwave, ethereal, france, french, k7, lost desert, spleen ideal with tags lyon, pro memoria. You can follow any responses to this entry through the RSS 2.0 feed You can leave a response, or trackback from your own site. I’m the former bass player of the band. It always seems a little bit weird that people want to hear our music 25 years after we released it, but it’s nice too ! !